Construction project management requires the expertise, knowledge, and skills of a traditional project management team. However, the phases of a construction project are different than that of traditional project management. 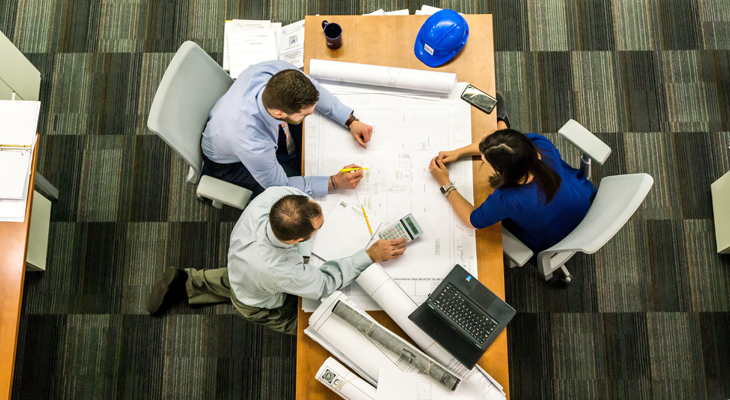 Large construction projects are complex in nature and there is a need for a large array of relevant experience in handling various technical aspects, managing a diverse team, and meeting defined objectives. Before a project is commenced, the project manager must analyze and develop the business case to determine whether or not the project is economically viable and worth undertaking. Other stakeholders may be requested to conduct feasibility testing. It is important for all the stakeholders to be on the same page and agree to proceed with the project. Writing a project initiation document, which defines the business needs and requirements, is one of the initial activities. Irrespective of the industry, developing a roadmap is one of the most important project management tasks. It includes the approved document and the project management plan. The planning process involves preparing documents that guide execution and control as well as set the baseline for schedule, cost, and scope. Scope statement, work breakdown structures (WBS), risk management and communication plans are some of the important aspects of the planning phase. Scope documentation defines the project’s objectives, deliverables, key milestones, benefits, etc., while work breakdown structure distributes the project in manageable chunks. A communication plan focuses on creating a common framework that everyone can use to avoid or resolve conflicts and misunderstandings. As the name suggests, a risk management plan is all about identifying the potential risks and devising strategies to handle them. When it comes to construction, exceeding the estimated cost and late project delivery are two of the major risks. In the execution phase, the project management team assign resources, set up tracking systems implement project management plans, update the schedule, and complete all the tasks while observing strict adherence to predefined budget and project timeline. Progress measurement is an important aspect that helps managers keep track of the field progress. The closure is the final phase where project managers hold a meeting to review and discuss the overall status of a project in terms of completed and uncompleted objectives. The construction industry can sometimes struggles to deliver projects on time and within budget. It is vital to have to an experienced project management team in order to ensure success. Quality Millwright provides construction and project management expertise as one of our prime services. Visit our website or contact us to learn more about our millwright services in Edmonton and across Canada.